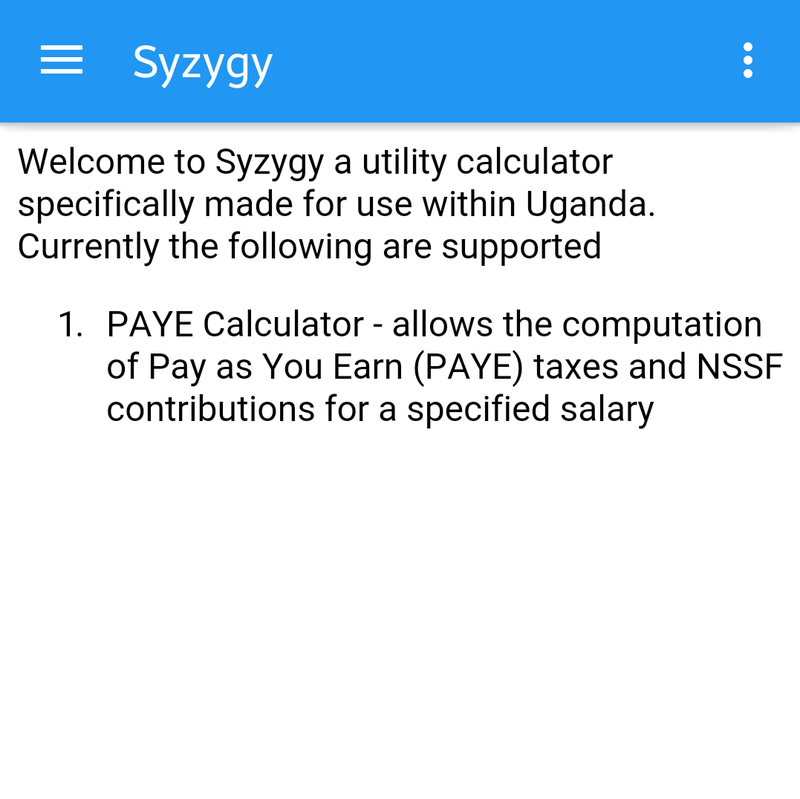 Just as Google has rebranded into Alphabet, on behalf of Styx Technology Group I would like to officially announce the launching of Syzygy which is a platform for a comprehensive utility calculator for Uganda based on PAYE Calculator (https://play.google.com/store/apps/details?id=co.databud.payecalculator) which was released by myself in 2012. 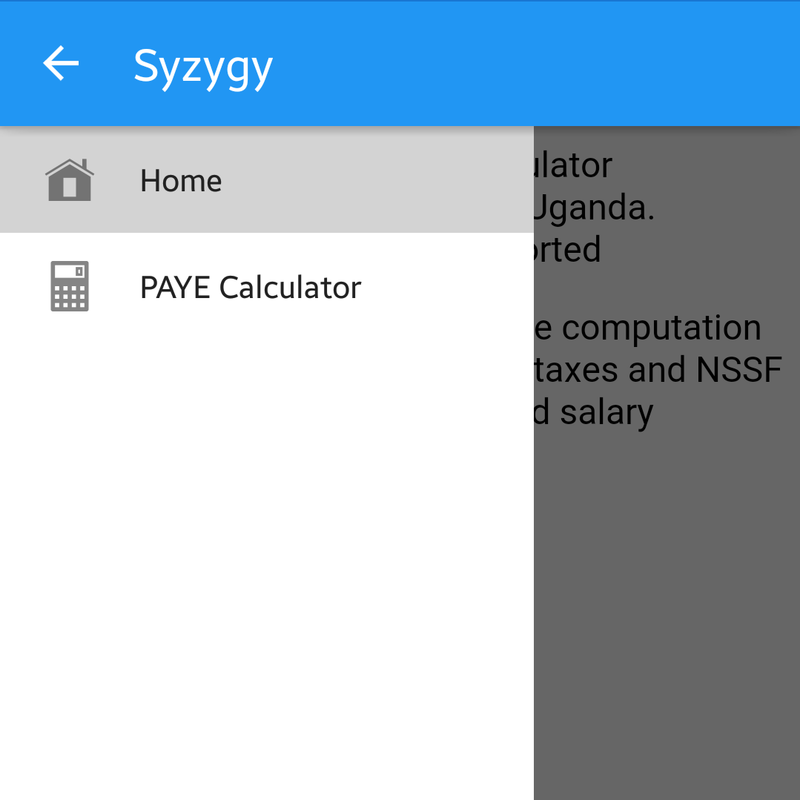 There are many calculators and utility apps out there, but there are none focused on Uganda specific computations and tools required within the country today. 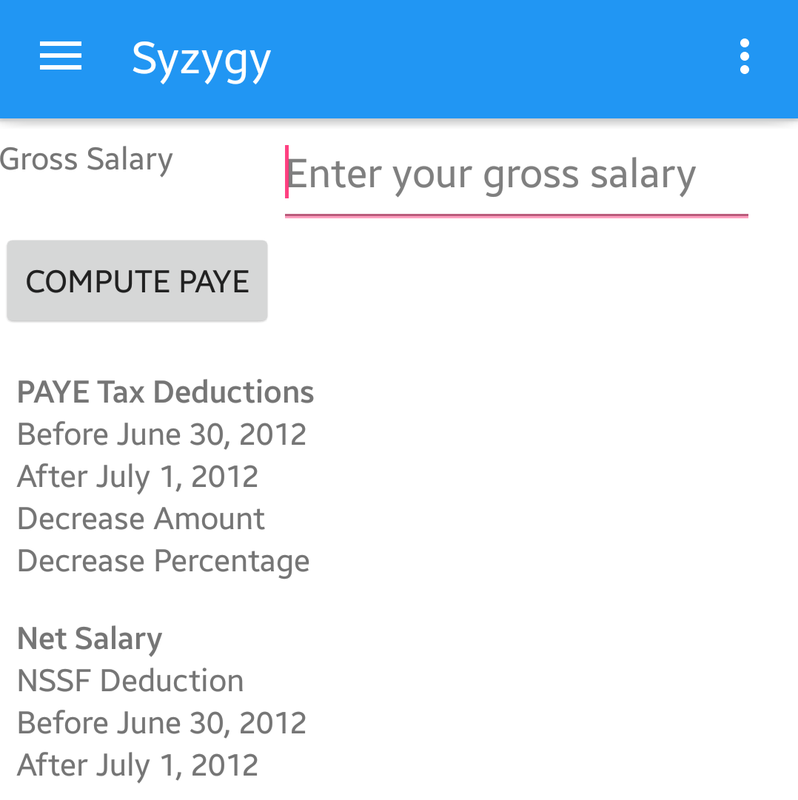 This initial launch is an upgrade of the look and feel of PAYE Calculator to the Android material design, refactoring of the back end to provide the necessary modularity for expansion. Layouts will be as fluid as possible to handle multiple screen sizes, however more focus will be placed on functionality to make this app useful after all Material design is already beautiful. As few permissions as possible will be requested of you during installation, after all the app does not need them. Syzygy – In astronomy this is when there are three (3) celestial bodies in a straight line usually the earth, sun and moon. At this point once could argue that the bodies are either in conjunction (working together) or in opposition. In reference to this utility all the tools are meant to work together so that the sum of the parts is greater than the whole. Styx – In Greek mythology this is the river in between this world and the underworld, with the power to make one invincible. We at Styx Technology Group seek to bridge the divide between those who understand and those who do not understand technology, its impact to society and how to leverage it for growth. When is the IOS version coming out? Is there a web platform? There is no IOS version planned in the near future there are lots more Android users than IOS within Uganda. The web platform is in the plan, but will be driven by the feature set that the end users find useful.